After a week in which I hardly had time to think about being pregnant, week 17 has been the complete opposite. Loads of time to concentrate on the little one growing inside me and how it feels to be pregnant. Firstly , after a couple of weeks off I was finally able to go back to my weekly aquanatal class. I’ve gone back to exactly the same class that I did when pregnant with Little Miss C and Master C and it’s so so lovely to be back. A 45 minute long weekly class run by a midwife from the local hospital and it is just perfect. There’s so much I want to say about the benefits of aquanatal (and I will write that post very soon – especially since Zoggs have given me a couple of maternity swimsuits to review!) but as well as loving the woman who runs it, I just find it a perfect once a week treat to indulge in being pregnant. It’s also great exercise (if hard work at times!) and wonderful to meet some other women who are expecting babies at similar times. It is a little strange going back as so much has changed since I was last there six years ago. But at the same time it’s nice to also have a bit of a link to my past pregnancies too. Also this week I had my 16 week midwife appointment down at the doctors surgery. My maternity care has been a bit all over the place so far this pregnancy. Having moved house I had to register with a new doctors practice, and I chose one based on having a community midwife attached to it so that I don’t have to go to the hospital (and pay for their parking) every appointment. They got my notes transferred over and booked me in for a first appointment and there were no problems. At this they organised for the midwife to come to me at home for the booking appointment, but unfortunately a family bereavement meant she had to cancel and then the appointment was picked up by someone else a week later. All fine. These things happen I thought. That booking appointment all went fine – despite struggling to take blood samples from me – and I was then booked in for the 16 week appointment (in week 17 to avoid having to take the kids with me during half term). To be honest though I’m not really all that sure what the purpose of the appointment was. Yes my blood pressure was taken and a urine sample tested for signs of protein, but that was pretty much it. She looked at my blood test results and told me they were all ok. She also told me to go and book myself in for a whooping cough jab with the nurse, but that was it. No listening to baby’s heartbeat. No asking how I was even. I left feeling a bit surprised and I guess let down. Pregnancy always comes with a few worries, so I was hoping to at least be measured and his or her heart listened to just to know that everything was OK in there. For our own peace of mind we’ve bought a doppler online, but I’d much rather have had a professional just tell me if you see what I mean. I have my 20 week scan to look forward to, and she told me that they will finally listen to the heartbeat at the week 25 appointment. Both of those just seem so far away right now. 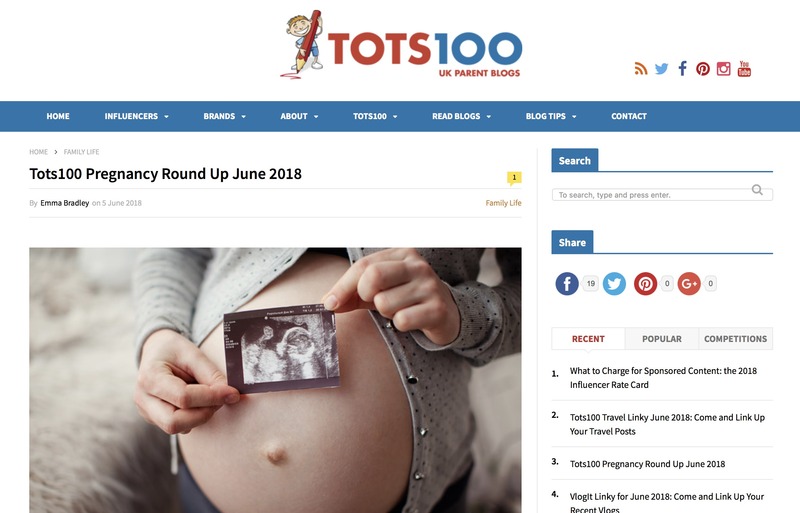 My final bit of baby related news for the week is that I’m delighted to be the new Tots 100 Pregnancy Round Up Editor. As I’ve said before, being pregnant feels so different this time round. I’m also realising how much I’ve forgotten over the last 6 years so reading pregnancy blogs has filled a bit of a gap in my knowledge. I’m really looking forward to following other blogger’s pregnancy journeys, and continuing to pick up all the things I’ve forgotten from them all! And in-between all that baby-related activity the week has really just been all about being a mum to my other two. Lots of taxi driving services for swimming lessons and Cubs, as well as a very important 8th birthday to prepare for. 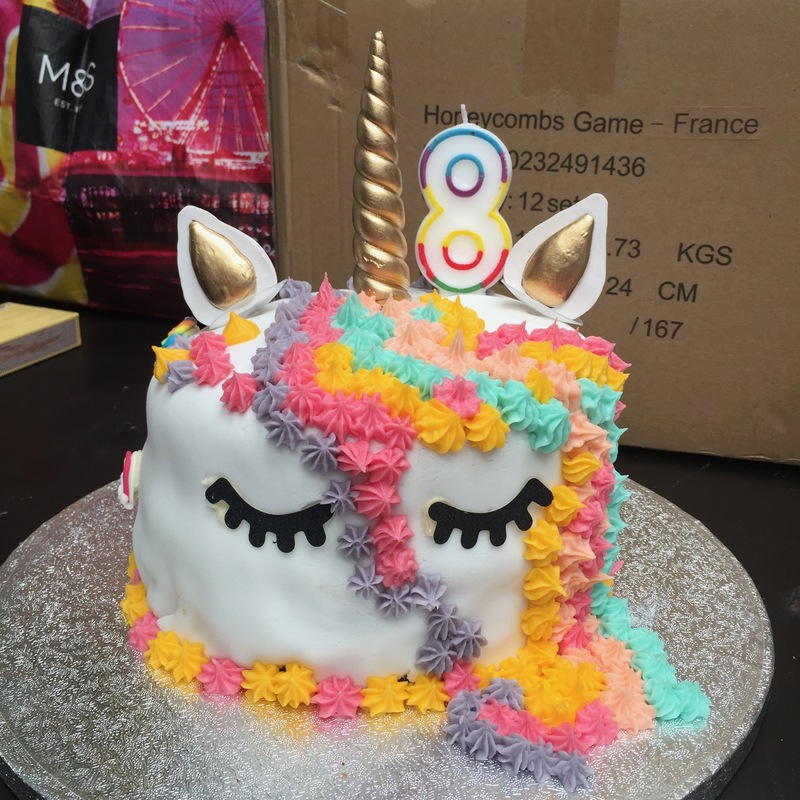 I somehow managed to pull off making her the much wanted unicorn cake. Not totally sure I would have succeeded had it not been for B suddenly revealing amazing cake decorating skills that I didn’t know he had! Look out for a “how to” post coming very soon.